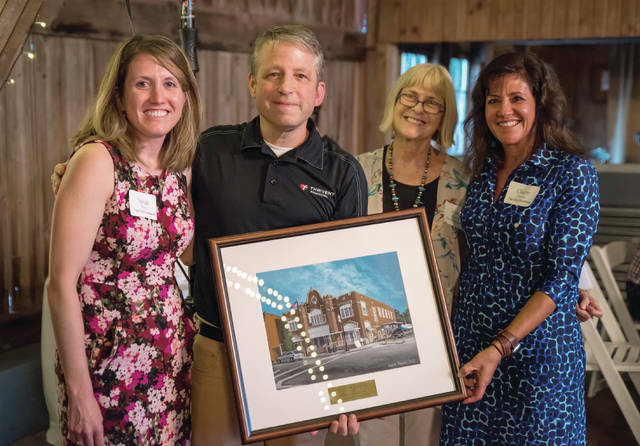 Provided photo Matt Buehrer, pictured with Tipp City Foundation members Sarah Worley, Mary Bowman and Claire Timmer, was recognized as the 2018 Philanthropist of the Year by the foundation. TIPP CITY — In recognition of his efforts to serve people in and out of the Tipp City community, Matt Buehrer was awarded the Philanthropist of the Year by the Tipp City Foundation. Buehrer received the award at the foundation’s Diamond Jubilee celebration on Sept. 20 at The Willow Tree. Buehrer was instrumental in organizing the local giving circle, Give Where You Live Miami County, where he serves as co-chair. GWYL has donated over $120,000 to local charities in Miami County since its inception. Last year, he organized a Fill the Truck for Texans in the aftermath of Hurricane Harvey. Four semi-trailers were filled with over 120,000 pounds of supplies and sent down to Houston to help the victims. Buehrer drove one of the semis himself. In addition, Buehrer has given countless time and effort to support Tipp Monroe Community Services, Needy Baskets, Pink Ribbon Girls, the InterFaith Community Foundation, and Stand Up to POTS. Webster’s Dictionary defines a philanthropist as “someone who makes an active effort to promote human welfare,” which is exactly how Buehrer conducts his life. For more information regarding the Philanthropist of the Year award or the Tipp City Foundation, please visit www.tippfoundation.org. The Tipp City Foundation is a member fund of The Troy Foundation. https://www.weeklyrecordherald.com/wp-content/uploads/sites/51/2018/10/web1_Matt-Buehrer-Philanthropy-award-2018.jpgProvided photo Matt Buehrer, pictured with Tipp City Foundation members Sarah Worley, Mary Bowman and Claire Timmer, was recognized as the 2018 Philanthropist of the Year by the foundation.